The following is an excerpt of research conducted by Jeffrey D. Schultz, Chief Climatologist at Weather 2000. For additional information visit our research page. Does a cool May foretell a cool Summer? 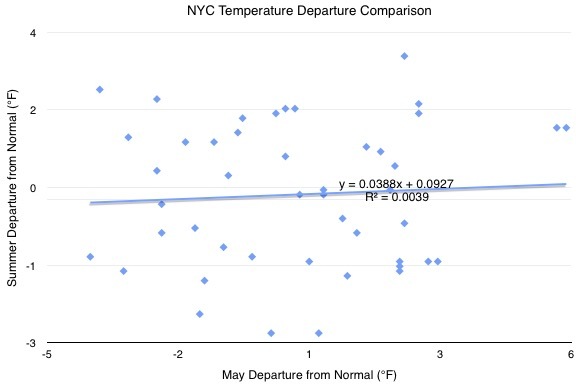 May average temperatures (departures from normal) for New York Central Park, NY (NYC) are compared to Summer average temperatures (departures from normal). Climatological Summer is defined as June/July/August, normal is the 1981-2010 average, above normal is any positive anomaly, below normal is any negative anomaly, and exactly normal is no anomaly, ie 0.0 degrees. Thus, in the above analysis, we see that 50.0% of the time, a warm May is followed by a warm Summer or a cold May is followed by a cold Summer, while 45.6% of the time, warmth is followed by cold (or vice versa). The following graph shows the departures from normal for May and Summer average temperatures, plotted against each other. The numbers were sorted in ascending order of May departures, to see if there was any type of grouping or correlation. The correlation coefficient is 0.0624, which is not statistically significant enough to use as a forecasting tool. * - In the event that this research shall be proven to be inaccurate and that this inaccuracy shall have been caused by the act or default of the author or Weather 2000, Inc., then the liability of the author or Weather 2000, Inc., shall be none. Under no circumstances shall the author or Weather 2000, Inc., be liable to compensate or indemnify any party, for or in respect of, any consequential loss or damage sustained by any such party as a result of the inaccuracy of this research.